All About Love: The Anatomy of An Unruly Emotion- Lisa Appignanesi. This is a book about the mind, psychology and love. So far she seems to be drawing a lot on personal experience, and there is only a very personal psychology element, but I am only about 18 pages in! I picked it up in a bookshop all the way back in January and started reading it right there but somehow never went back to it until now. It’s been a long time since I read a psychology book so I’m looking forward to this one. The Picture of Dorian Gray- Oscar Wilde is another one which has been on the TBR pile for almost a year. I downloaded it free to my kindle when I got it (the kindle) in December, but it has been on my wishlist since I started The Rory List. In fact it was someone on BCF who started me wanting to read The Picture of Dorian Gray. Irv’s Odyssey: Lost In a Looking Glass- Irv H. Polodsky is the story of a film graduate who wants nothing more than to make meaningful films but cannot get a break. Desperate for money he agrees to start directing porography , and when that becomes to much he makes a move to working as an aide in a mental hospital. My full review of this should be up tomorrow, but for now just know I fairly well enjoyed it. The Thief- Fuminori Nakamura features a skilled pickpocket who manages to get himself into a mafia type gang and political intrigue. The book had some good things I hadn’t expected but also left out elements I expected. My review should be out later this week. The Etymologicon- Mark Forsyth was a book I loved. It’s all about words and how they came to be. Come on Daisy- Jane Simmons was my Children’s Hour pick last week. It follows Daisy’s journey accross the pond which she gets so involved in that she looses sight of Mummy duck. Reservation Road- John Burnham Schwartz was sent to me by the lovely people from Corsair for review. I have the sequel, Northwest Corner on the TBR pile from them already but wanted to read Reservation Road first. Follows the story of two people following a hit and run. It follows the father of the boy who is killed as he searches for the killer, and follows the hit and run drier himself. Garden of Stones- Sophie Littlefield was given to me by Harlequin via netgalley. It follows the story of a Japanese-American woman and her daughter who are sent to Manzanar prison camp after the Japanese attack Pearl Harbour. I’m interested in reading this one as it isn’t a part of history you see covered that much, but it’s still from my favourite era for historical fiction to be based in. Today I’m reading Percy Jackson book 4. I’m a YA addict. Nice mailbox..I like the sounds of GARDEN STONES. Great eclectic mix of books! Garden of Stones sounds really interesting to me too. I love historical fiction. That cover is really eye catching too. 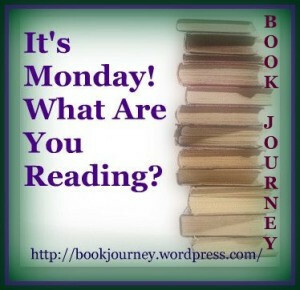 Today I think I am going to finish off The Silvered, by Tanya Huff. Fortunately, there are still a few hours of Monday on the west coast! I think I might have to add Garden of Stone to my TBR as well. It sounds good. I only heard about The Thief yesterday on Netgalley, and I requested it for review. It sounds like you weren’t all the way convinced about this book. I’ll look out for your review.